CNN political commentator Kirsten Powers said Friday that because President Donald Trump does and says racist things, all who support him are racist as well. 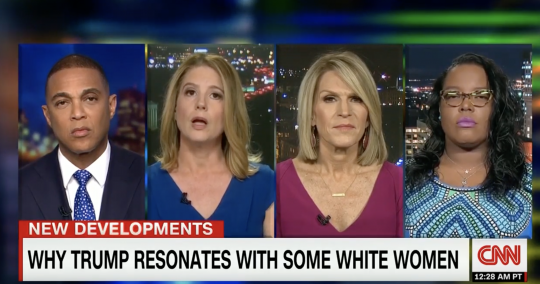 Speaking with the chyron "Why Trump Resonates With White Women" below her on "CNN Tonight" with Don Lemon, Powers said Trump's racist rhetoric from his campaign to the present was too vast to summarize as she assessed white women who support the president. "They’ll say, ‘Well, I’m not racist. I just voted for him because, you know, I didn’t like Hillary Clinton,'" the former Clinton administration official said. "And I just want to say that’s not—that doesn’t make you not racist. It actually makes you racist. If you support somebody who does racist things, that makes you racist. So, I just want to establish that. "As for why white women do it, I think we have to recognize that white men are doing it as well, but I think sometimes we would hope that we would get better behavior from white women, because white women are themselves oppressed and that they would, therefore, be able to be aligned themselves with other oppressed people," Powers continued. "But, I think we have to remember that the white patriarchal system actually benefits white women in a lot of ways, and they’re attached to white men, who are benefitting from the system that was created by them, for them, and their fathers and their husbands and their brothers are benefitting from the system, and so they are also benefitting." Berkeley professor Stephanie Jones-Rogers discussed her research on white women's economic role in slavery and tied their longtime "deep investment in white supremacy" to their "overwhelming" support for Trump. She said despite their "oppressed" status as women, they failed to sympathize at the ballot box with other dispossessed peoples. Lemon gently reminded her that 52 percent of white women supported Trump in the 2016 election, hardly a massive figure–she countered that it was "emotionally overwhelming." Fellow CNN commentator Alice Stewart, who worked for Sen. Ted Cruz's (R., Texas) presidential campaign, balked at Jones-Rogers' notion that all women were oppressed and thus would vote in consort with other oppressed groups, and then addressed Powers' notion about being racist for supporting Trump. "I'm a Republican. I support this president. I voted for this president," Stewart said. "I did so because of his policies. I do not agree with his tone and tenor … Kirsten is a dear friend of mine, but I resent the fact she says I'm racist because Donald Trump says racist things. I support this president because of his policies and the things that he says that are disparaging and disgusting, which I've said many times, those don't represent me." Powers said "you don't have to support him" and added she would not support any Democrat who said misogynist or racist things. "I want to step back for a second and say look, we spent a lot of time talking about Republican women," she said. "There's a problem with white women, it doesn't matter whether they're Democrats or Republicans or nothing. There's a problem with racism. Every white person benefits from an inherently racist system that is structurally racist. So we are all—we're all part of the problem. I'm not trying to point my finger at you or another person. But I think we have to recognize there's institutional racism in this country." This entry was posted in Politics and tagged CNN, Don Lemon, Donald Trump, Media, Racism. Bookmark the permalink.